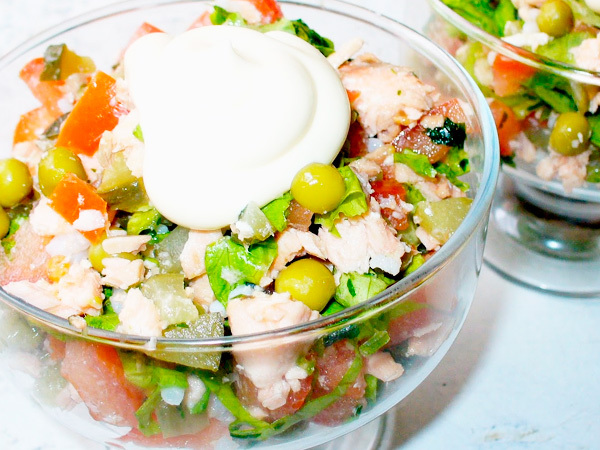 If you like fish, the recipe of this salad with boiled salmon you will like it. The taste of the dish it is quite spicy. Vegetables and Apple blend perfectly with the meat boiled fish. - pink — 1 PC. Any classic salad recipe with boiled salmon implies a base of boiled fish. For these purposes it is better to take a whole salmon, but the fit and normal fillets. Lay the prepared fish pieces in a saucepan, cover with boiling water, add the herbs and seasoning. The water level should be more fish 5 inches. You can add carrots, parsley, pepper. When the water boils, remove the foam and cook for a further 7 minutes. After you remove all the ingredients. Slice pre boiled the potatoes and carrots into small cubes. Wash the cucumber in water and not cutting off skin, chop it into cubes. Grate the Apple on a coarse grater or cut into small strips. Tear the washed lettuce leaves into small pieces. Grate cheese on a medium grater. Mix all prepared ingredients, except cheese, and season them with mayonnaise. If you want to use instead of mayonnaise sour cream this dressing much like much more. Products can be mixed randomly, but you can do layers, it will be delicious anyway. On top garnish the dish with grated cheese. Serve the salad with boiled salmon to the table, together with boiled potatoes in their skins or without, rice, buckwheat, slices of bread or loaf.